The idea for these brilliant clothespin wreaths came from Kirstin at Kojo Designs, who made it as a tea wreath, and it is one of my favorite projects. the perfect gift – beautiful, unique, and useful! I think Kirstin’s tutorial pretty much covers it all. I had only a few variations for making mine. I also loved thinking up new ways to use these wreaths! Here are the simple steps with my tips. 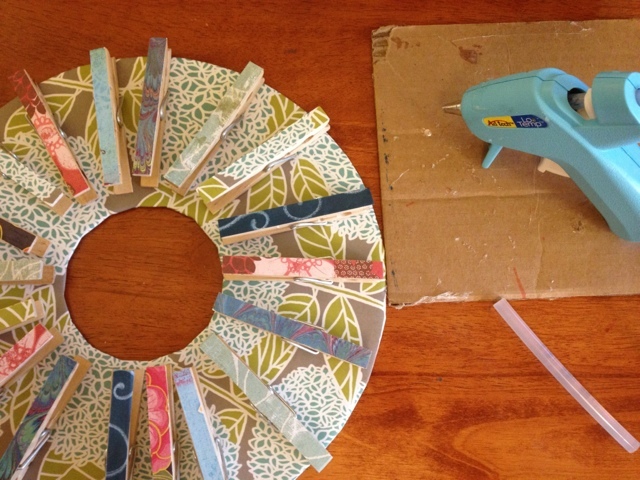 Cut a cardboard wreath using sturdy corrugated cardboard or two pieces of thinner board glued together. I used a plate for tracing the outside circle and a scrapbooking template for the inner circle, though you could also use a cup. If you are using scrapbooking paper, make sure your wreath is no bigger than 11 inches in diameter, so you can wrap the 12 inch paper around. 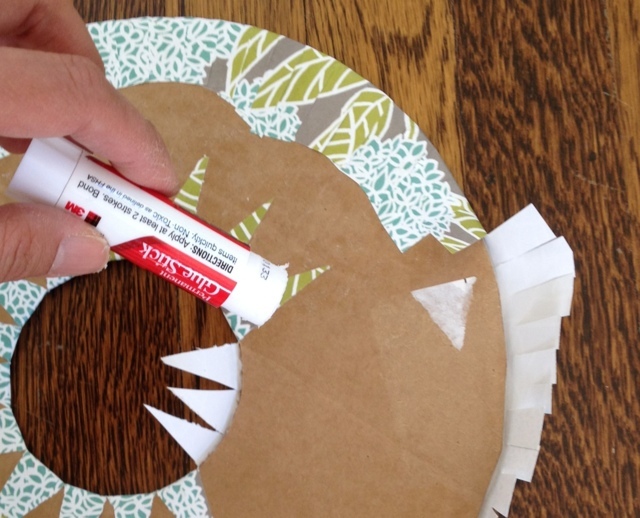 Cut your paper in a circle 1/2 to 1 inch bigger all around than your wreath. The more room you have the easier it will be to wrap the paper around. 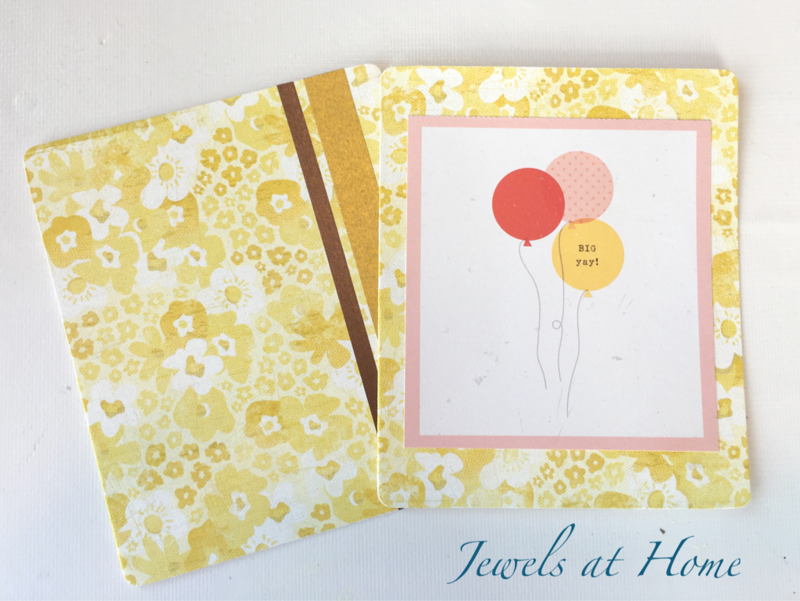 I used a beautiful wrapping paper called Hydrangeas by Kate & Birdie. I’ll have more projects with that paper coming up! 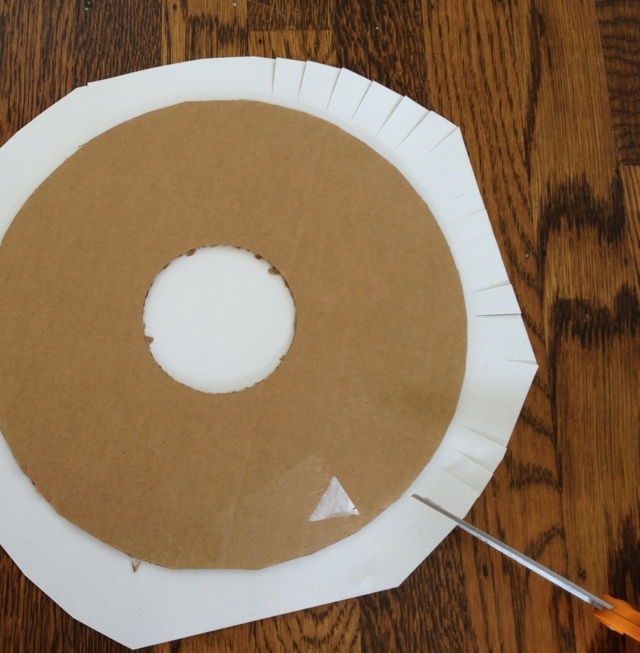 Center your cardboard base on the paper and glue in place. I preferred to use a glue stick for this step, to give a smooth finish. Cut tabs around the outside and the center. I didn’t cut all the way to the cardboard, so the the tabs would not show on the sides. Glue down the tabs in the back. I used the glue stick here, also. Wrapping the wreath base. 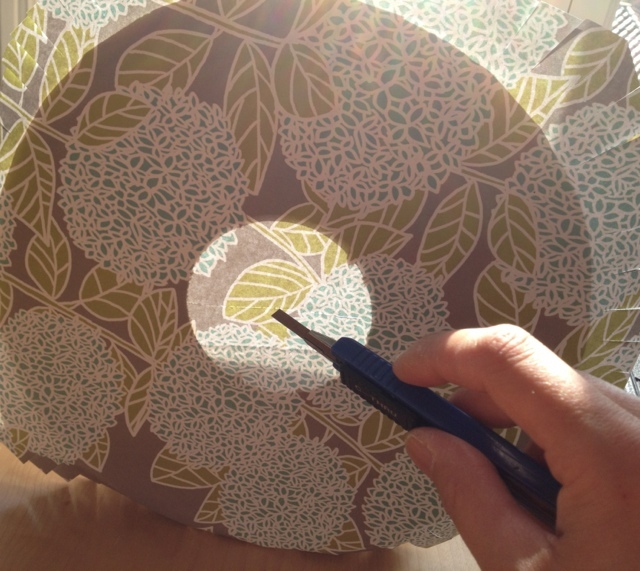 After glueing the circle in place, cut tabs around the outside. I used a craft knife to cut the tabs in the center and held the wreath up to the light to see where to cut. I liked the glue stick for glueing down the tabs. It sticks quickly and doesn’t wrinkle the paper. 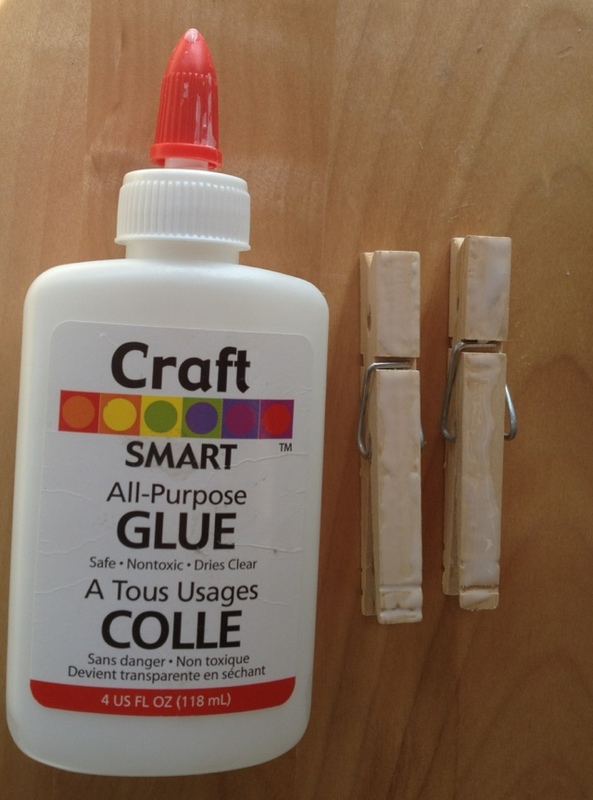 You can find wood clothespins online or at a hardware or craft store. Try the dollar store, too! Cut strips of paper the width of the clothespins. This is a great way to use up all sorts of small scraps of paper that are too beautiful to waste. 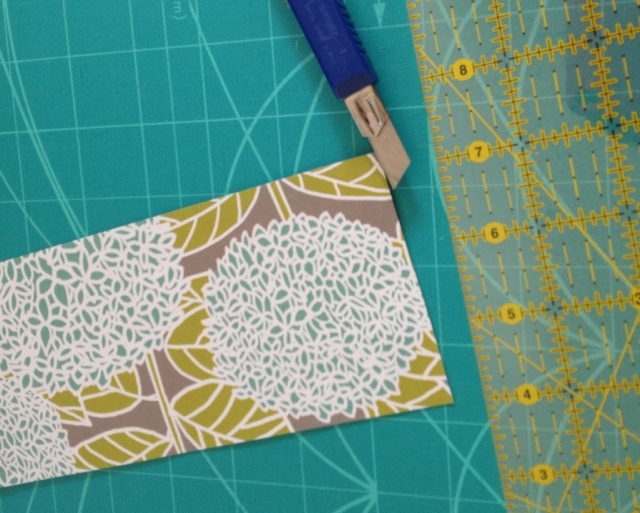 To cut the thin strips, I used the trusty quilting ruler and mat I used in making the fabric growth charts. Glue the strips to the pins. I used white glue to attach the paper to the clothespins, because it soaks into the porous surface of the wood and leaves a smooth finish. I spread the glue on one pin and then pressed it against a second one, to get a thin layer that completely covered the side of the pin. 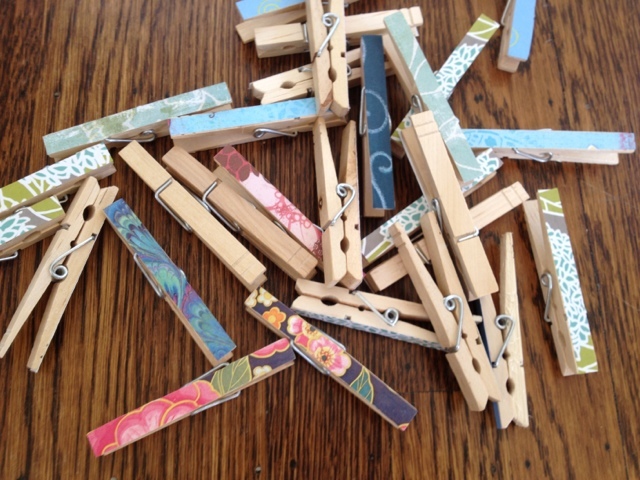 I used a quilting ruler and mat to cut precise strips of paper for the clothespins. I used white glue for covering the pins with paper. By pressing two pins together, you get a thin even layer of glue. Wow! These clothespins are so beautiful! Using a glue gun, attach the pins around the wreath, with the clips facing outward. Loop a ribbon around for hanging. You could also use some adhesive strips on the back, if you don’t want to see the ribbon. I like the 3M picture hangers I used for putting up the oversize wall initials. Finish the wreath by glueing the pins in place with a hot glue gun and adding a ribbon to hang it. While I gave the wreaths away with tea bags, my friends and I have found new uses for these beautiful wreaths. Here are some of our ideas. I’d love to hear yours, too! 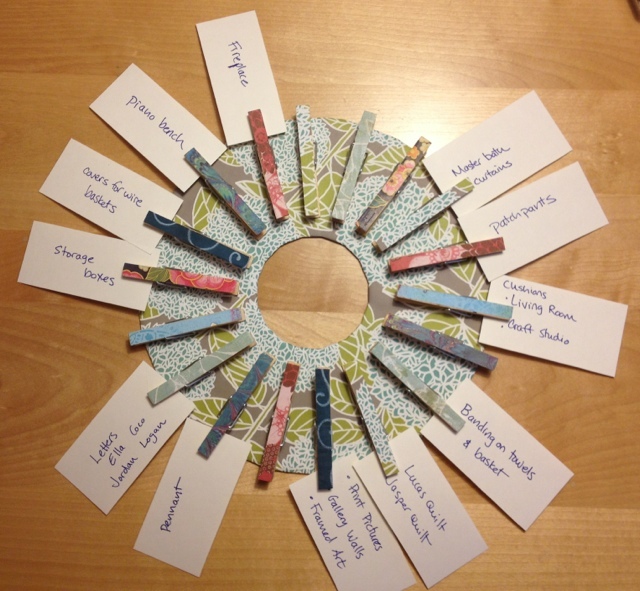 Appreciation wreath – My friend Monica used hers to write messages of appreciation to her kids. She used index cards cut in half and wrote in a different color for each child. 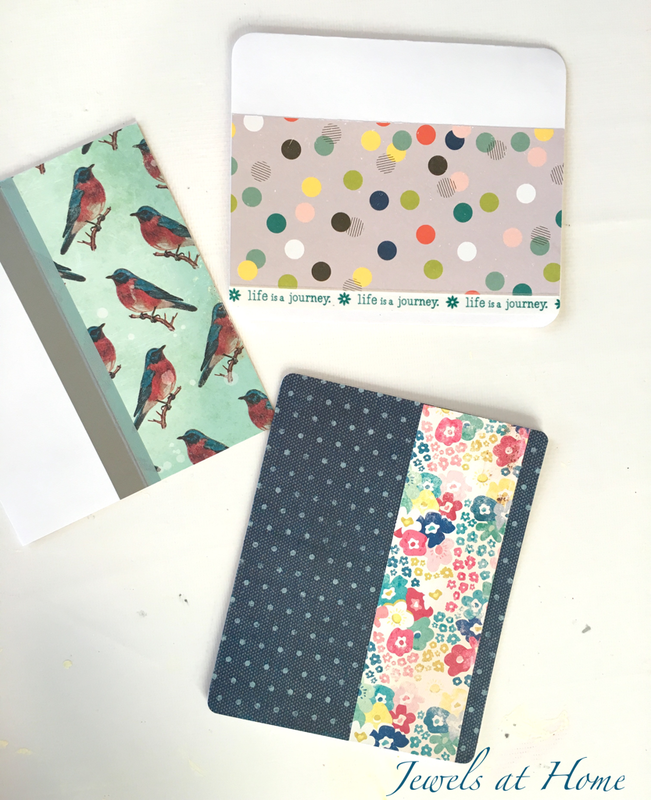 Inspiration board – I’m using mine to pin ideas for craft and DIY projects. Photo display – what a pretty way to display your favorite pictures! 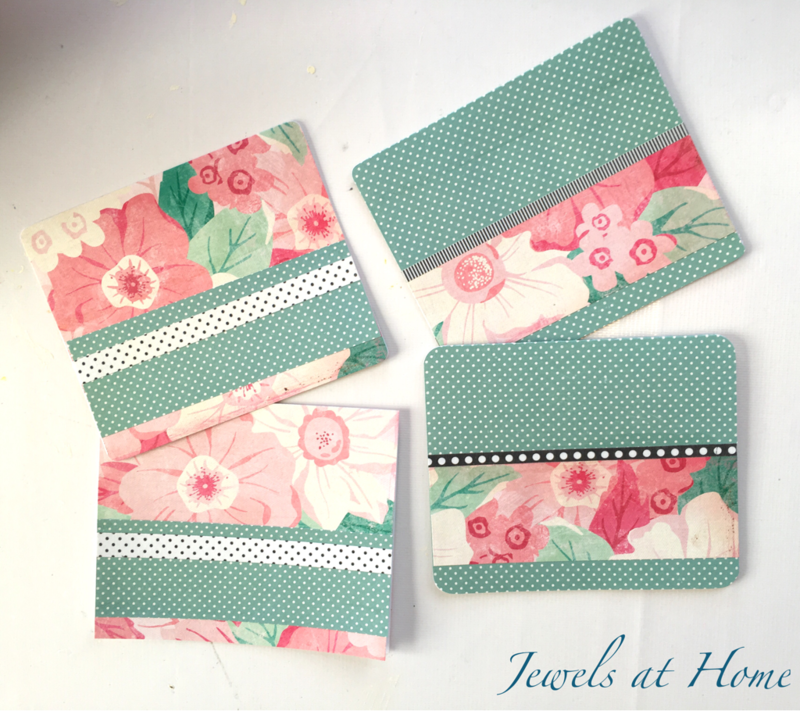 Card holder – for holiday cards, birthday cards, business cards. I’m using my wreath to organize ideas for projects. I might need some more pins! 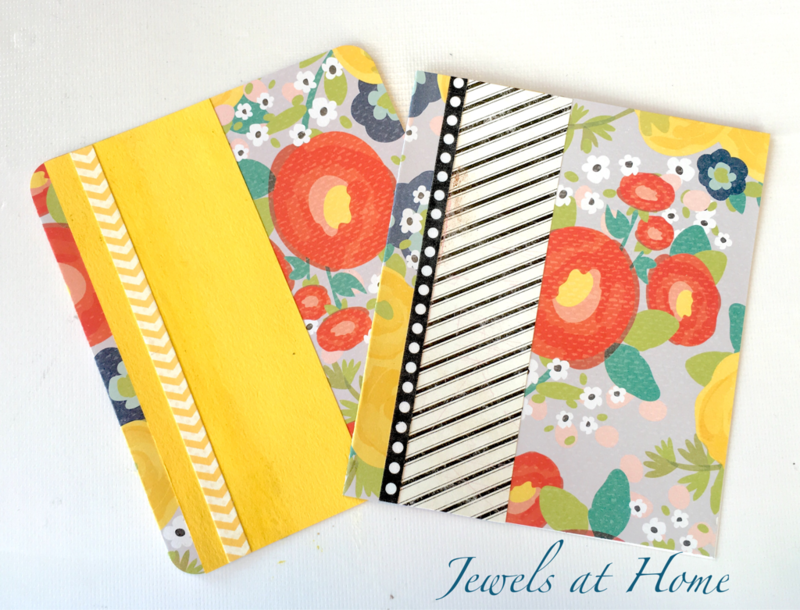 Mount the pins on a rectangular backing for a memo board or photos. Put magnets on the back to use on fridges or magnet boards. If you don’t have a fridge that holds magnets, you can stick the clips directly on the fridge with a removable adhesive, which is what I did with these clips for kids art. Set up a “clothesline” art gallery and use these pretty clips to easily hang and change the kids’ projects. 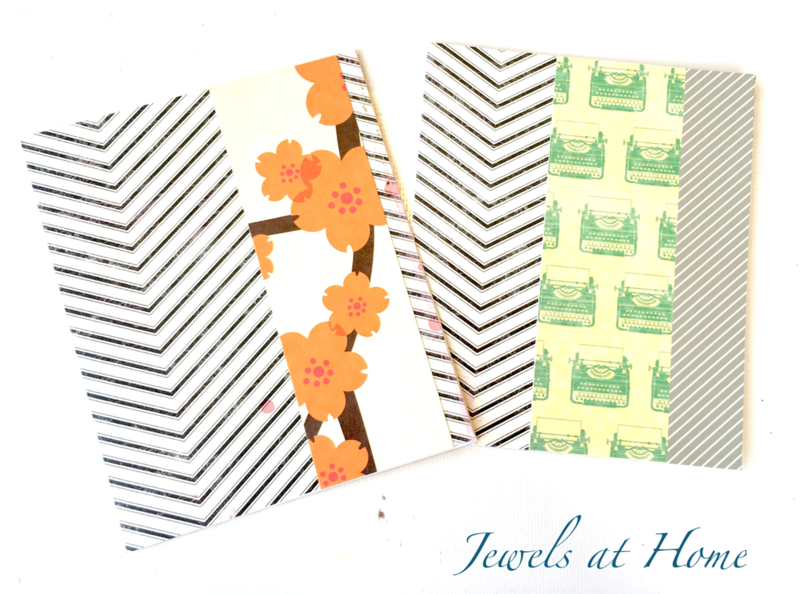 Clip together papers or swatches to organize your office or craft room. 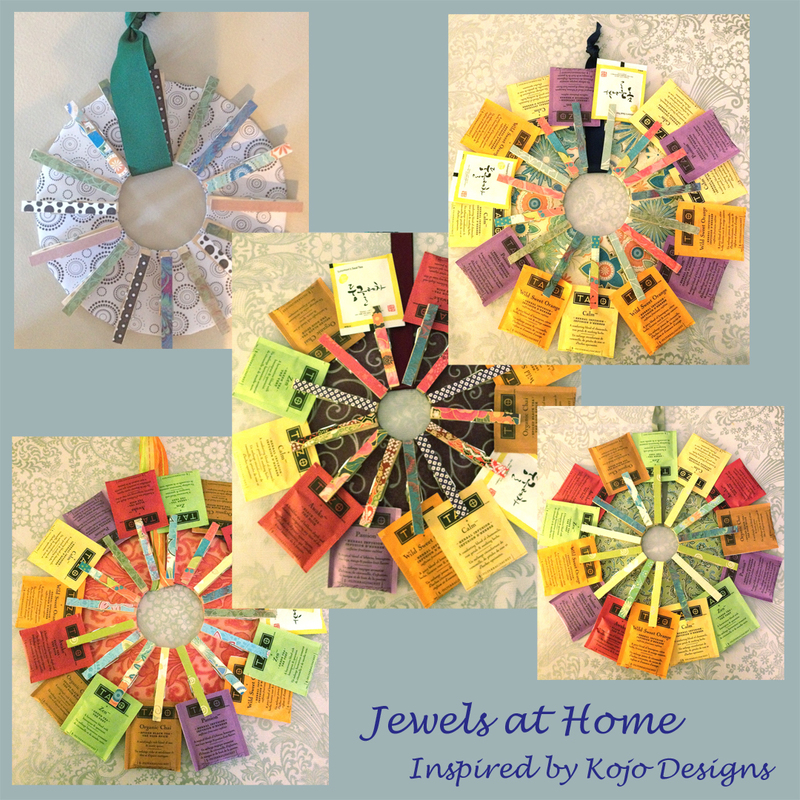 Thanks again to Kirstin at Kojo Designs for this wonderful project idea. It has become a standby for me, and I hope you will let me know if you come up with new ideas for these beautiful wreaths and pins!